Paul Ryan, Poverty Warrior? Huh? Then you read page after page, trying to figure out what the dude is actually saying he’d do to lower poverty, and here’s what you’re left with: vouchers, tax credits, and volunteerism. And is that not the story of Rep. Ryan? His is the classic example of the adage that if you’ve got a reputation for being an early riser, you can sleep til noon. What are his accomplishments? He’s authored some of the harshest and most unrealistic budgets I’ve ever seen, and I’ve been on this beat for awhile–none of them have or are going anywhere legislatively. His proposals to block grant major safety net programs (freeze their spending levels and hand them over to states), like SNAP and Medicaid, would gut their critical countercyclical function (as was the case with TANF). He used the Heritage Foundation’s economic wizards to predict the his budget would reduce unemployment to less than 3% (don’t look for this forecast, though–his team pulled it once they actually, you know, looked at it). OK, time to get to work, and I’m sorry to start the day with negativity and snark. But the emperor in the empty suit has no clothes. Share the post "Paul Ryan, Poverty Warrior? Huh?" 17 comments in reply to "Paul Ryan, Poverty Warrior? Huh?" He also favors expanded unskilled guest worker programs. His approach to immigration maximizes the negative impact that immigration has on labor. So a tea party hero like Ryan who wants to end any state supports for the poor or the old is also a welcomer of cheap labor. 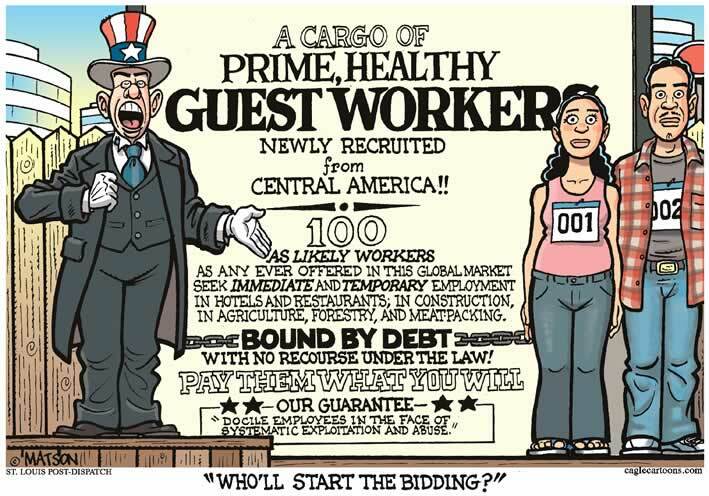 I was always told it was the democrats and left of center who were pushing for the influx of cheap labor. But here you are telling me actually someone like Ryan supports it for entirely negative reasons? Surely the right wing tea party worker hating types would gain nothing by increasing the pool of labor even now? As evidenced by his weight lifting photos, and his worldview that if we just put $ signs on our cigarettes that we’ll restore America’s greatness, he’s a child who never grew up. And, because the media needs him to balance out their narrative and to write copy, we have to endure his occasional outbursts. We’d be far better off recognizing who he is, and what he’ll never be, and then just like with Palin try to ignore his cries for attention. Thanks, Jared. I am tired of reading Washington Post articles authored by people directed to write an article by their editors who have to google people like Jack Kemp to find out who they are, then pretend that they know why the subject of their article is like that person. So he’s going around saying ‘I’m from the government and I’m here to help.’? I guess he is just trying to make what Reagan said true. Yeah, flimflam man, blame LBJ. ” … conservatives were the ones who insisted on making family breakups a condition for welfare. Remember the ‘man in the house’ rule*? That was the one that said families couldn’t get assistance if there was an able-bodied man in the house. It was enacted because opponents of welfare, particularly Southern conservatives, simply couldn’t abide the idea of government ‘handouts’ to male heads-of-household. * This rule was struck down by the Supreme Court in 1968, but by then severe damage had been done to the structure of poor families — damage that has been passed on and on. If Ryan wants to get people off the public dole, perhaps he should lead by example, and get off the public dole. That is a really easy blank to fill in. Step 4 is quite obviously poor people starving to death and/or dying from various other health issues. Fewer living poor people = smaller percentage of the population living in poverty. Wait, are you saying that the plan is to reduce the excess population? Think Ryan is due to be visited by three ghosts Christmas Eve, or is he such a lost cause they won’t bother? Johnny, I think you forgot the third option – providing these lazy, careless poors with guaranteed housing* and free meals* if they and their families worked for one of the many fine corporations which provide our industries with important raw materials such as coal, produce and cotton. Of course, they would have to meet certain common-sense production quotas, and be subject to potential relocation should their contracts be transferred to some other avuncular corporation. Naturally, continued inclusion in this program would be entirely at the corporation’s discretion, and there would be no guarantees that family members would be employed within the same department or even the same geographic region. Furthermore, attempting to ‘run out’ on the lifetime contract would be considered a felony, and sheriffs or private deputies would be used to track down, restrain and return the criminals to the benevolent overview of the generous corporation. It’s really a win-win! *within reason, and subject to management approval. Picture a dog that’s lost a leg. If you chop off the leg diagonal to the missing leg, that dog will have only two legs to stand on, but those two legs will grow strong. That’s how Paul Ryan and the Republicans will help out the sixth of the nation living in poverty. After he cuts off food stamps, SSI, and medicaid, all the Poor will no longer be burdened by dependency upon the federal government. They will be free to boldly accomplish all that needs to be done to get ahead. Paul Ryan believes in letting quadriplegics pull themselves up by their own bootstraps. He won’t support government payments to help them out and he won’t support collecting taxes from the most successful among us to help the least of us, but he will encourage all of us to pray for the success of those who so unfortunately chose the wrong ancestors. Bless his heart. Isn’t he generous? Don’t you see? Ryan defines (a priori) “poor” as “receiving funds or goods from the government”. Voila, the answer is clear. I think that everyone is wrong about Paul Ryan. I think he gets a bad rap. I think he is a “Poverty Warrior” I happen to know that he and his family volunteered at the Youngstown soup kitchen during his campaign for Vice President in 2012. Doesn’t anyone else remember this profound act of charity? Paul Ryan, his family and his photographers showed up at the soup kitchen uninvited after the food had already been served and there were no longer patrons in the facility. They bullied their way into the empty kitchen with their photographers. He and his family all put on aprons. Then they proceeded to pretend to wash the already-clean dishes and pans as they posed for their photo op. What do you have to say now, you haters? How do you like them apples? I heard him say The federal money should be sent to the States, so it can be controlled at the lower level. he never heard of E.O.A. 88-452? ?